Forget about take out! 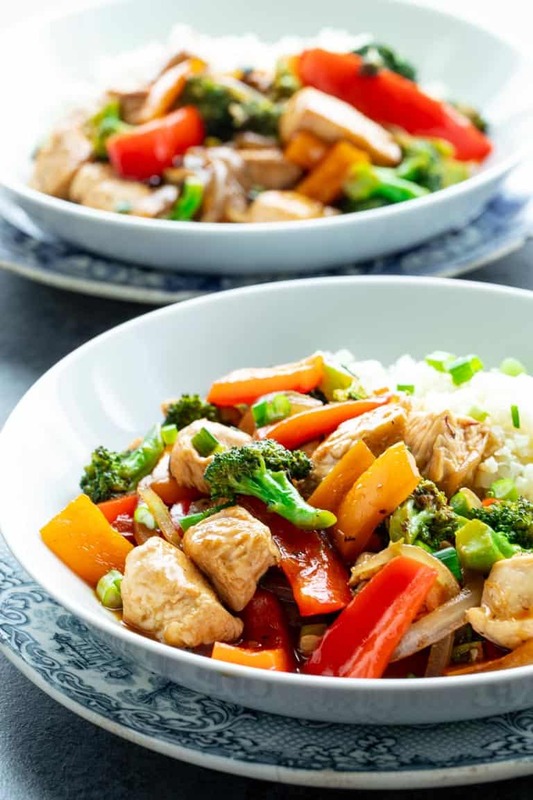 This easy and healthy Chicken and Veggie Stir-fry is a 30 minute veggie-heavy dinner the whole family will love. It’s grain-free and soy-free so that means it’s Paleo friendly! It’s loaded with broccoli, peppers and boneless skinless chicken breast. This year I am thrilled to be partnering with one of my favorite brands, La Tourangellle Artisan Oils. I have been in love with their oils for years, and have even featured them here on Healthy Seasonal Recipes in an unofficial capacity before. I have always loved them for their high quality, heart healthy pure oils. Not to mention for their drop-dead gorgeous packaging! But recently I learned there is even more to love. La Tourangelle is family owned and was originally in France. Now it operates using the same 150 year old techniques at a mill in California- the only one of its kind here in the states! Anyway, I could gush on and on forever, so I am going to try to stay somewhat focused today. 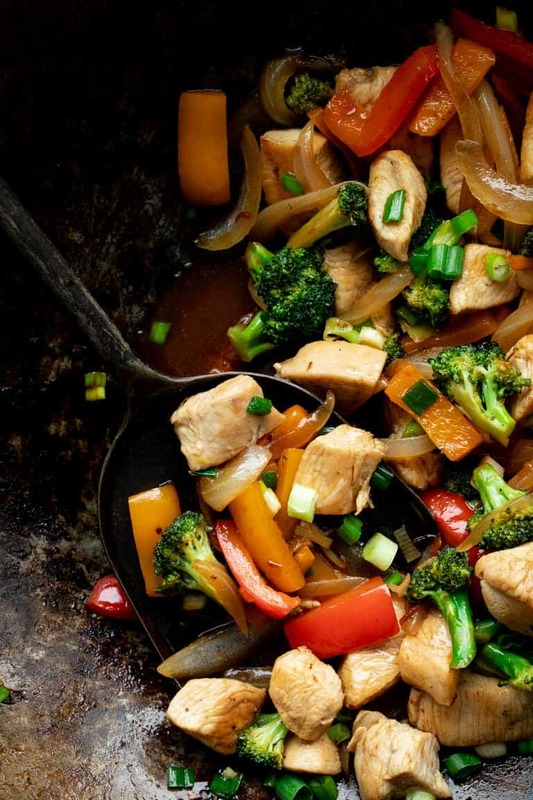 I have a super simple paleo-friendly stir-fry with chicken and veggies in it. I thought it would be a great healthy recipe to share during the January paleo challenge my husband and I are doing. Speaking of which, eating paleo (aka grain-free and dairy free) this month is going great! Jase told me this morning he has already lost 8 pounds! And my belly issues have improved! It’s amazing! Thank you so much for all of your support during this time! I am so grateful for you guys! One of the things I wanted to talk about is about why I used two different oils in it. But first, we have to talk about smoke point. Do you know what the smoke point of oil is? That’s the temperature at which an oil starts to go from being a liquid to a vapor and it gradually begins starting to smoke. You’ve likely seen this before, if you are heating up oil in your skillet, and get distracted, and all of a sudden your skillet is smoking! Well that’s because it got so hot that it reached its smoke point. When it does, the oil’s structure breaks down (which isn’t healthy) and it’ll take on a foul taste and smell. Different oils have different smoke points. Luckily you can look right on the packaging of La Tourangelle artisan oils to see which should be used at lower temps and which can be used at higher ones. There is a little thermometer letting you know which type of oil it is. The smoke point is why I decided that I wanted to use two separate oils for this recipe. First I used grape-seed oil which is a high-heat neutral cooking oil. I used that to sear the chicken and veggies over high heat. 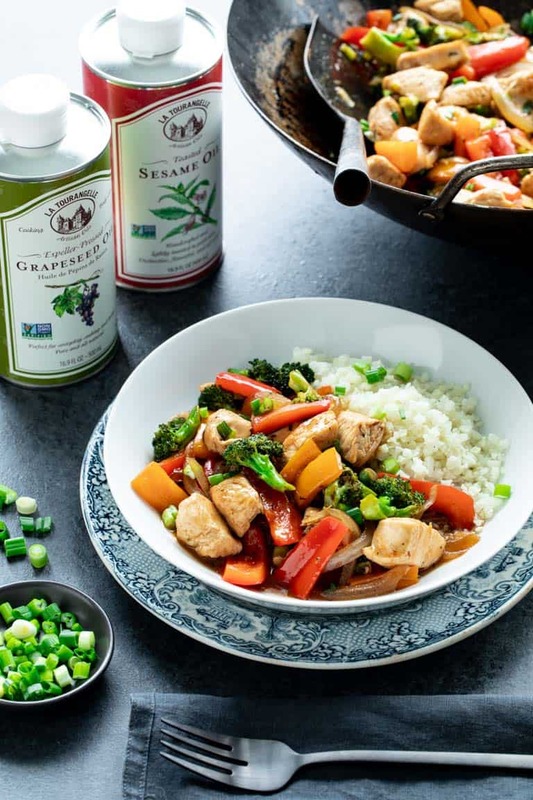 Since it has a high smoke point, the oil is not damaged by the higher heat required in a stir-fry. And then I added Toasted Sesame Oil as a second, super flavorful, oil to add to the sauce to make the veggies and chicken flavors pop! The liquid in the sauce brings the temperature of the pan down, and prevents the oil from getting to that smoke point. If you have a wok, this is the time to bust it out. 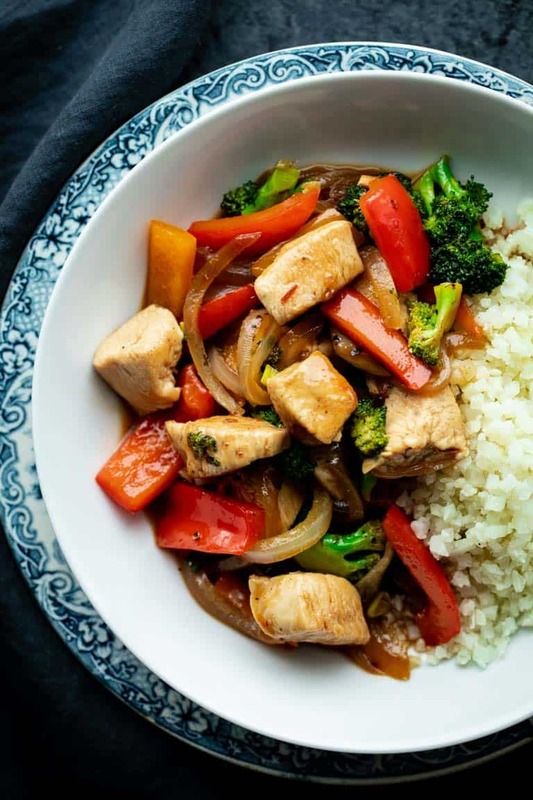 This stir-fry has a lot of veggies in it, so you will need it for its big size. If you don’t have one and are thinking of getting one, I really love mine. It is basic, but that’s all you need. Get one with a rounded bottom and a lid like this one (that’s an affiliate link) if you can. If you don’t have a wok, use a very large heavy bottom skillet. You’ll need a lid that can fit over it too. As always, with stir-fries, it’s important to get your mis en place together before you begin. Stir-fries are quick and completely hands-on, so you won’t have time to be chopping or stirring once the food hits that hot oil! I like to cut my veggies first, then the chicken. That way I only have to wash and sanitize the cutting board once. Once it’s cut, just set everything next to the stove in prep bowls. Get that wok or skillet hot! Add the oil in and swirl it to coat the surface. Then the chicken cooks first. Add it onto the cooking surface in a single layer so that it can sear. It will stick to the surface if you try to move it around, so just let it sit for several minutes and get a nice golden brown sear on the bottom surface. Then take your spatula, and scoop up some of the chicken and flip it over onto an uncooked side. You can’t be too fussy about this because it’ll be hotter than blazes and the oil may be spluttering about, so just flip it all as best you can. At this point the chicken will likely bring your cooking surface temperature down a bit, so it will not take on too much additional browning, and it will be easier to stir once or twice. To see if it is cooked through, use your spatula to split a piece in half. There should be no pink in the center. Take the chicken out of the wok or skillet when it is cooked through and set it aside on a plate or bowl. Covering it with foil is helpful to keep the heat in and trap any moisture that wants to evaporate. Next the veggies need to be stir-fried. So you need more oil. But if there is any moisture in the wok or skillet you will get splattering, so let it evaporate for a second or two before adding in the second tablespoon of oil. Again, swirl it to coat the surface. Then add in the veggies! I used a combo of broccoli, peppers and onions because that is a slam dunk combo in my family. If you prefer other veggies, use them instead. Just try to keep in mind its best to cook veggies that cook at the same rate, and to cut harder, slower cooking veggies into smaller pieces to make sure they become tender. After the veggies have had a chance to get a bit blistered in the hot oil, next comes in the sauce! The sauce is made up of simple ingredients. If you are not paleo, you can use tamari or soy sauce instead of coconut aminos. And you can use Sriracha instead of Sambal Oelek. As I said earlier, the La Tourangelle toasted sesame oil is rich and flavorful and it will add a lot of complex flavor to the final dish. The sauce is thickened with arrowroot starch which is a staple in a paleo pantry because it is grain-free but works like cornstarch to thicken sauces. It can also be used in baking or as a substitute in other recipes like pancakes. Swap 2 teaspoons of cornstarch for the arrowroot if you prefer it and aren’t paleo. Once the sauce is added, set the lid on top of the wok or skillet and let the veggies steam in the sauce. To make sure the veggies cook evenly, take the lid off and stir the veggies in to the sauce a couple times while it is cooking. The veggies will become tender in just a few minutes. I prefer a nice bit of toothsome texture to my veggies when I make a stir-fry so I often err or the shorter end of the spectrum. All that’s left is adding the chicken back in! I also add in some scallions to layer in the flavor. I served the Paleo Chicken and Veggie Stir-fry with cauliflower rice. If you are not grain free some other options would be brown rice or rice noodles. To try either of these delicious high quality artisan oils by La Tourangelle, you can pop right over here to have them sent right to your doorstep! Have you ever let a skillet of oil get too hot? Have you ever tasted oil that has gotten past its smoke point? What kind of veggies do you add to a stir-fry that you know your family will love? Forget about take-out! 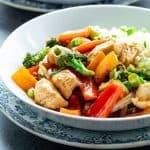 This easy and healthy Chicken and Veggie Stir-fry is a 30 minute veggie-heavy dinner the whole family will love. It’s grain-free and soy-free so that means it’s Paleo friendly! It’s loaded with broccoli, peppers and boneless skinless chicken breast. Whisk broth, coconut aminos, maple syrup, chili sauce, La Tourangelle Toasted Sesame Oil and arrowroot in a small bowl. 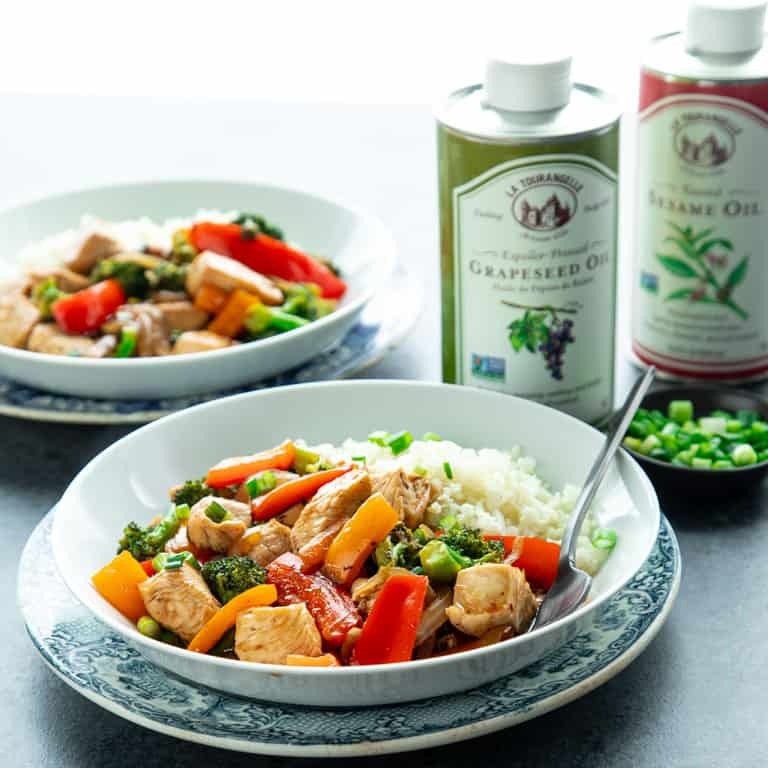 Heat 1 tablespoon La Tourangelle Grapeseed Oil in a wok or large heavy skillet over high heat. Swirl to coat the cooking surface and add chicken in a single layer, and let cook, undisturbed until seared, 2 to 3 minutes. Turn the chicken over and continue cooking, stirring once or twice more until the chicken is browned and cooked through, 2 to 4 minutes longer. Transfer the chicken and any liquid from the wok or skillet to a large plate and cover with foil. If the wok or skillet is moist, set over the heat and allow any liquid to evaporate. Once the surface is dry, add the remaining tablespoon oil and swirl to coat the hot cooking surface. Add peppers, onion and broccoli, and stir fry until the peppers are browned and blistered in spots, and the onions are starting to soften, 3 to 5 minutes. Add the sauce, toss to coat and cover. Let cook, covered (stirring once or twice) until the broccoli is bright green and the onions are tender, about 4 minutes. Remove lid, stir in chicken and any accumulated juices from the plate and scallions and cook until heated through and the sauce is loosened by the chicken liquid. Serve hot. Love a good stir fry recipe to take the place of take out!!! Great share! That’s what I think too. We don’t do take out Chinese here. Mostly because there aren’t any close and good Chinese restaurants. So when I wan’t a stir-fry, I pull out the wok. Thanks so much for coming by Tisha. LOVE all the colors goin’ on in this dish! Excellent use of toasted sesame oil too! YUM. Thank you so much Catherine. Colorful stir-fries are an easy sell, aren’t they? My kids love them! I just seasoned my wok. Now I can make this chicken stir fry in it. It looks perfect! So psyched to hear that Andrea! Enjoy! I love your recipes bc they always take advantage of what’s in season. This quick and easy dinner would be a hit with my kids and I can see it being in regular rotation! Hi Karen. Thanks so much for saying so. That’s really nice to hear. Have a great week. Thank you for all the great information and cooking techniques. I love making stir fry recipes. You’re welcome Dianna. We love them too. Have a nice week. This looks SO flavorful and delicious. I love stirfrys on busy weeknights! Thank you Jean! Have a great weekend. The arrowroot really helps make the sauce cling to the veggies and chicken better. I love a good stir fry that’s filled with veggies! This looks great. Hi Anne! So glad you agree. I love having a way to get in our veggie servings at dinner, that’s not a salad. I mean I love salad, but this is a great change of pace!